Supposedly, you’ve already filled your theoretical knowledge gaps and prepared hardware after reading the first part. Before we move on to the essence, I just want to mention that while I was writing this part, a few questions arised that most likely would’ve stayed unanswered without Ivan‘s input – thanks (officially 🙂 ) for being so helpful! Ok, what are we doing again? 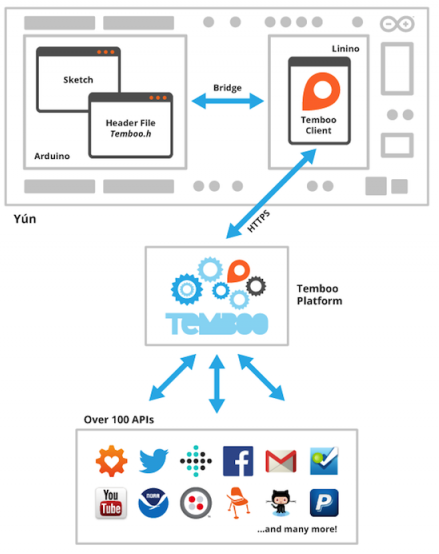 We are going to use Temboo’s client (preinstalled on every Yún) to communicate it with API of Parse.com – a mobile backend – which will then send a push notification to Android device. As it states on the official site “Temboo makes it easy for the Arduino Yún to connect to over 100 web-based resources and services (e.g. Facebook, Dropbox, US Census data) by standardizing how you interact with their Application Programming Interfaces (APIs)”. To be more specific, it makes it easy to call these external API’s with smart code snippets called Choreos (all of Choreos are listed here). 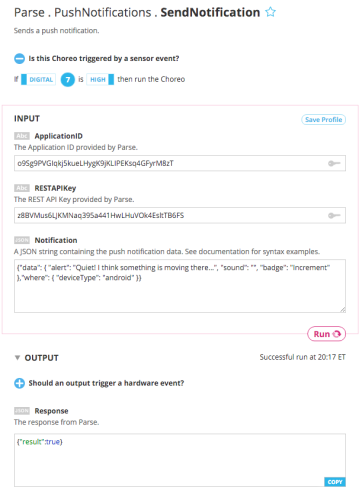 Note: You can also call Parse API without Temboo’s Choreos – using the official Arduino Yun Parse SDK. I’ve decided to describe Temboo as it seems to be much more universal, but if your project is anything more than hobbyist experiment you need to know that Temboo gives you only 250 api calls per month for free (for me, it looks like they’re enforcing usage of their referral plan) so just keep in mind that Parse’s free plan seems much better. Ok, firstly we need to obtain API keys. 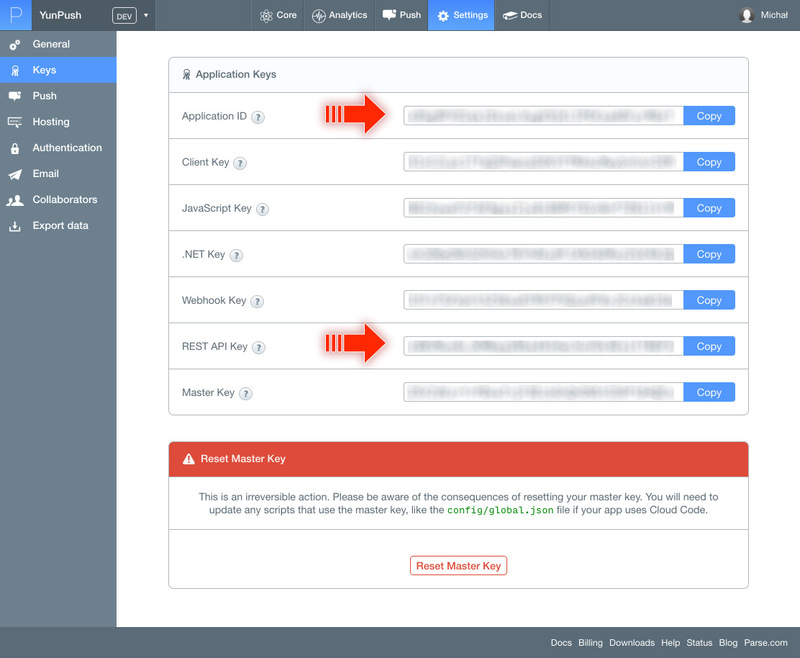 Register your app on Parse.com and open it’s Settings > Keys. You will need Application ID and REST API Key. I’ve blurred out keys for example project, I must have missed Photoshop. If it’s ok, copy the code that got generated to /src/main.cpp and TembooAccount.h (new file)! Noone cares about blurring, right. 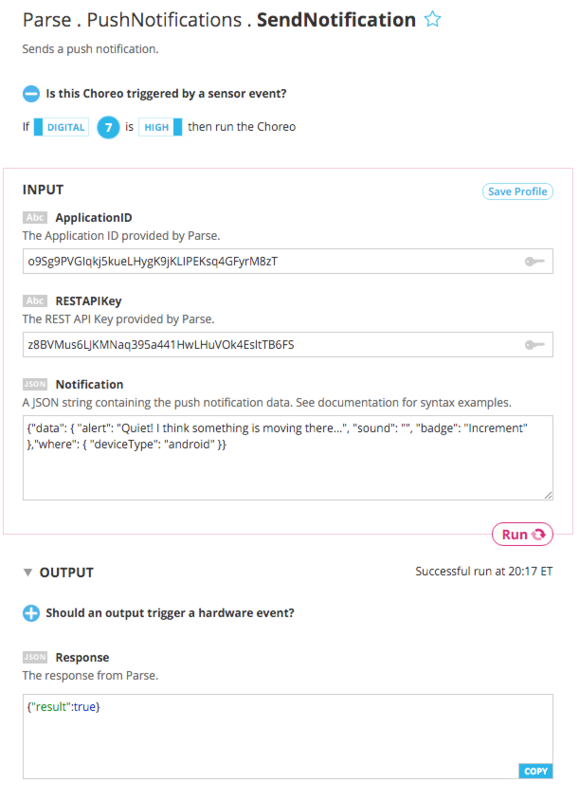 You can also view your sent pushes in Parse (in Push section). Note: Don’t miss the fact that the channel is defined to “yun” which means that if any device wants to receive this push it needs to be subscribed to this channel. What you’ve copied from Temboo is prepared to be executed as an *.ino file. As you might have noticed, I remain completely unconvinced about using Arduino IDE, it’s serial monitor or even *.ino files. 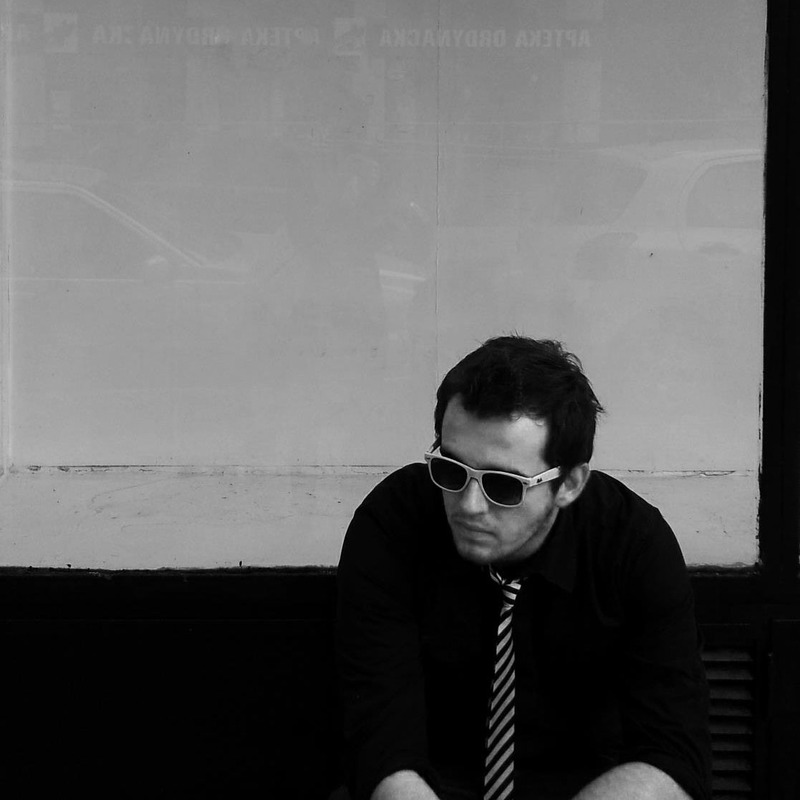 Let me bring out the little differences between *.ino and *.cpp files. 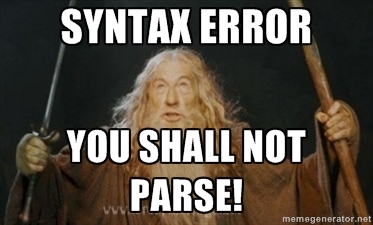 ‘Almost’ valid is not valid enough for C compilator, so let’s repair what was generated (and keep it a *.cpp file). Note: To be perfectly honest ‘Arduino.h’ is already included in both Bridge and Temboo, but we need to work on good habits, right? Note: If you would decide to go with *.ino – PlatformIO is also able to handle *.ino files and automatically adds what’s mentioned above at build time before compilation phase! 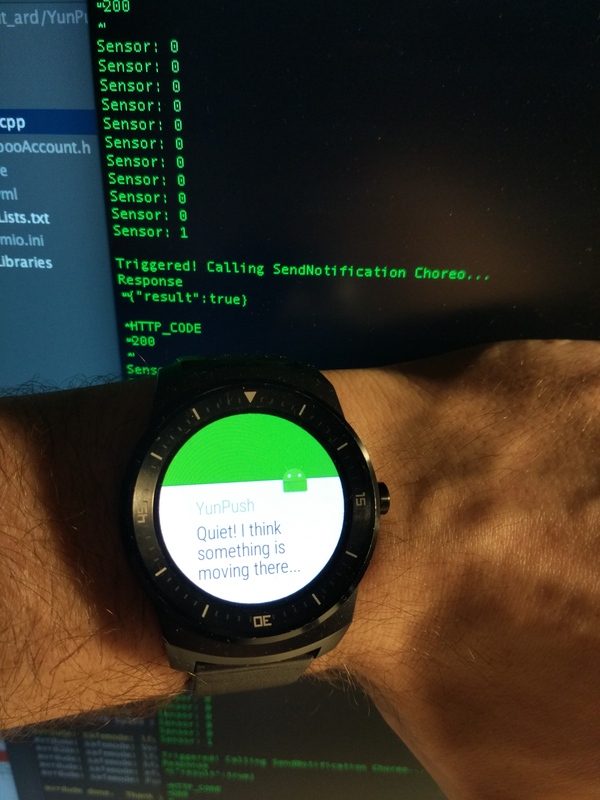 Now is the time to build & upload, connect serial port monitor and test if pushes are successfully sent through Parse. Then, once you’ve got it all set up.. Create a new project in Android Studio and edit your applications build file (/app/build.gradle) to add Parse’s SDK. Modify AndroidManifest.xml file in reference to mentioned Parse’s guide (especially remembering about changing the package name!). Run it on your device (with enabled developer options) and check on Parse (Core > Data > Installation) if it subscribed successfully. If so, you should receive push notifications from your Yún! 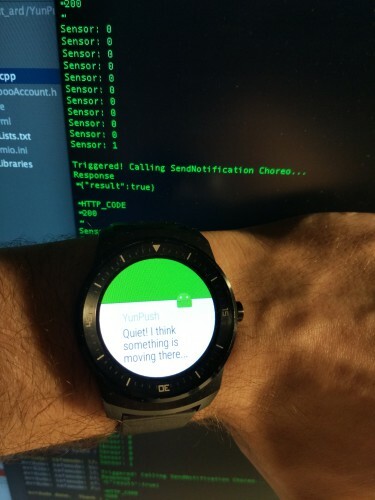 Android Wear device (like my G Watch R) is able to view notifications, no additional code was needed.